The Foundation of pHountain Starts with the Best Water. Now you can have pHountain pHresh water at every faucet and shower in your home. The water is directed through a Cutting-edge Multi-Stage Bacteriostatic Redox Reaction Catalytic Whole House Filtration System designed to remove and Reduce 278+ Contaminants, Chlorine, Chemicals, Heavy Metals and VOC’s without Salt and Maintenance. Automatically regenerates media to extend life of filter and to prevent contaminants from leaking back into water flow. Patented “Media Separator” Distributor – prevents stage 1 media from sinking to the bottom and becoming useless. Special Vortex Tank creates restructured reenergized water and reduces water usage by as much as 250 gallons per month. This creates a most unexpected phenomenon – an electrical potential (voltage) between the structured water and the water surrounding it. In other words, structured water stores energy, much like a battery. Structured water is a battery that needs constant charging. Energized structured water recharges the liquid battery of the body. When the body has sufficient energy, its aqueous interior is highly charged allowing for optimized cellular and metabolic function in addition to greater hydration and detoxification. pHountain pHresh water is literally brimming with energy. Does not use inefficient gravel or quartz. The problem with this is the filter gravel cuts down on your flows rates. When used as an upflow this type of system allows for channeling of the media bed, (water will seek it’s least path of resistance), when not forced in a specific direction, and it also slows down the flow during a regeneration cycle. The design creates fluidity of the media bed and extends contaminant removal capacity; which means less regenerations and significant reduction of water use. The pHountain pHresh system is salt free. Water Softeners use a 6-cycle valve for regeneration. The average water usage is from 90 to 150 gallons of water per recharge to rinse the salt used. This happens 2-3 times per week, depending on the family usage. This calculates to over 12,000 gallons of water wasted per year. The pHountain pHresh water system does not use Reverse Osmosis. Reverse Osmosis is a commonly used water purification method, unfortunately this method strips the water off all minerals and creates highly acidic water. The complete opposite of what is healthy and best for your body. Reverse Osmosis membranes can also build up bacteria quickly and if the system is not maintained properly this bacteria and contaminants can leak back into your water flow. This can undermine the whole purpose of the filtration system. Higher alkalinity right out of the tap. 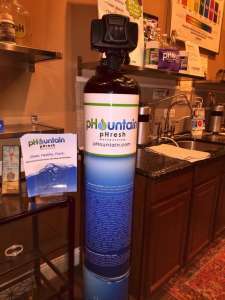 Because the pHountain pHresh Water System maintains all the healthy minerals in the water and doesn’t strip them out, your water has a healthy pH and alkaline level immediately. The pHountain pHresh Water System starts with a Unique Redox Reaction Media that is protected by 15 US patents and numerous foreign patents. It consists of a high-purity copper-zinc alloy that undergoes a chemical process called redox which is short for oxidation-reduction, this chemical reaction transfers electrons between molecules. In some cases, such as chlorine it changes it into benign substances then passes through the filter. Copper, lead, mercury and other heavy metals are also removed from the water supply through this first step. Stage 1 effectively removes up to 98% of inorganic water-soluble heavy metals that are a concern to the public. It also controls microorganisms and reduces lime scale in problem areas like showers and tubs, and changes waterborne calcium molecules that inhibit scale buildup and improves taste of your favorite beverages. The Patented Media Separator separates the medias inside the tank for better filtration. The redox reaction media is 8 times heavier than what is typically used. A lot of our competitors mix or blend medias, but after the first backwash of the system the heavier media falls to the bottom of the tank and is useless in the water filtration process. The media is truly bacteriostatic, and creates an electrolytic field that is deadly to some microorganisms. This special redox media is bacteriostatic while the filter is both inactive and active. It is Non-toxic and completely safe. It meets USEPA and US Food and Drug Administration standards. It is so safe that the EPS doesn’t require registration for its use in water. Reduces inorganic contaminants before they get to the next phase of filtration. Protects filtration system from bacterial fouling and bacterial buildup. Makes other filtration media lasts longer. Extends life of filter system by 15X. Is not effected by hot water and does not release trapped contaminants to re-enter the water flow. Reduces dry flakey skin and damaged hair. Helps control the unwanted growth of bacteria, fungi, algae, mold and lime scale. The second stage process starts where reactants are transported to active sites within a highly catalytic carbon structure, then the adsorption takes place at the catalytic site. Next a chemical reaction occurs on the carbon surface and reactions products are formed. The catalytic site is finally restored through desorption of gaseous product and removal of retained contaminants. The pHountain pHresh Water System uses only the highest grade of carbon in the world and out performs Coconut Shell Carbon by over 600%. The media performs at a controlled consistent catalytic activity, with up to 100X more catalytic sites for better electron transfer, and promotes a wide variety of chemical reactions where conventional carbons are not effective. It is the best available technology for the removal of many organic materials in surface water. Aluminum, Arsenic, Cadmium, Chromium, Copper, Iron, Lead, Manganese, Nickel, Zinc. Strontium, Uranium, Vanadium, and other radio active metal compound can be removed by the pHountain pHresh water system. This reagglomerated media has been proven to be more effective at chlorine and chloramines removal—as well as perform taste and odor removal at greater speeds than coconut-based carbons. Part of our stage 2 media formula can also remove chlorine, non-metal compounds and even radio nucleotides. Therefore, we consider it to be the most effective water filter available for all kinds of applications. There is NO maintenance required on this system. NO Salt or Potassium chloride to add. As long as there is power to the control valve and you can see the time on the valve it is working. We recommend getting your water tested every 5 years to ensure that the system is working at its peak performance.